Since launch, Cygnus has been going through its paces. The spacecraft performed overnight “free drift and abort” demonstrations, the first of ten milestones for the spacecraft as it proceeds to the station, and also carried out two orbit-raising engines burns. A third thruster burn is planned for Thursday afternoon. If everything continues on schedule—something that can’t be guaranteed on a test flight, although everything has gone well so far—Cygnus will arrive at the ISS and be grappled by the station’s robotic arm as early as 7:25 am EDT (1125 GMT) Sunday. Once there, Cygnus will remain attached to the station for 30 days before departing for a destructive reentry. The spacecraft is carrying 700 kilograms of supplies, more than any previous commercial cargo mission to the station, Orbital’s Frank Culbertson said at a post-launch press conference (a subtle dig at SpaceX’s three Dragon flights to the station.) 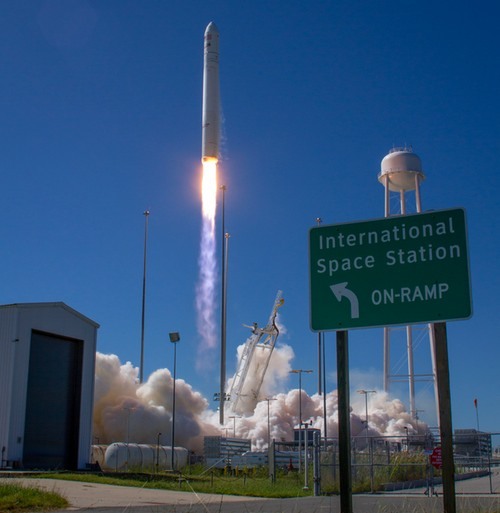 Culbertson added Orbital would be ready to fly another Cygnus mission, the first of eight under a commercial resupply contract with NASA, as early as December, although NASA officials said they will make a decision on whether Orbital or SpaceX will fly in the December launch opportunity after this test flight. Jeff Foust | September 19, 2013, at 12:15 pm | Category: Orbital, Orbital Sciences Corp.